Join us at Kinnard Farms this Father's Day 6/16/2019! Where do delicious dairy products come from? A non-profit organization of agriculture professionals and dedicated dairy farm families in Kewaunee County. We partner with the Dairy Farmers of Wisconsin to positively promote the dairy industry and products. What do we do? Each year our event “Breakfast on the Farm” is hosted by a different Kewaunee County Family Farm. This provides each host farm with the opportunity to tell their individual story and brings an element of discovery and new experiences to those that attend the event. We have three Dairy Ambassadors who work to educate school children about where their food comes from by visiting our county schools. They primarily teach how Wisconsin dairy farmers produce the quality dairy products they eat. We treat them with ice cream, yogurt or cheese sample along with fun educational materials. We also support local farmers’ farm tours, allowing school children to see where milk comes from, by providing milk, cheese, and ice cream treats for the kids. Look for Kewaunee County Dairy Promotion at the familiar “Little Red Barn” as seen at the Kewaunee County Fair as well as numerous other festivals, parades, events, and grocery promotions held each year! 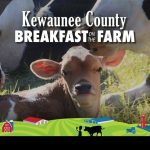 From providing chocolate milk & cheese at 5k/10k Runs to providing high class grilled cheese sandwiches at various events – Kewaunee County Dairy Promotion brings dairy to the community, at every opportunity.